FCT Minister, Malam Muhammad Musa Bello (right)being conferred with the award of the Grand Patron of Nigerian Students in the FCT, by the Chairman, National Association of Nigerian Students (NANS), FCT Chapter, Comrade Mojeed Kola Omolaja in Abuja. Minister of the Federal Capital Territory, Malam Muhammad Musa Bello has called on Nigerian students to give their full support to President Muhammadu Buhari and the ruling All Progressives Congress (APC) in the forthcoming elections, to ensure that the planned emergency in the education sector succeeds. 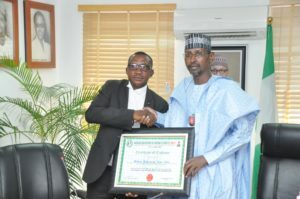 The FCT Minister, who made the call when he received the National Association of Nigerian Students (NANS), FCT Chapter, on an advocacy visit to his office on Tuesday, November 27, 2018, said the Buhari-led administration has already laid a solid foundation that will take education out of the woods. He said the impending emergency declaration in the sector will give further impetus to the gains already made. Malam Bello noted that it was imperative for students to give their support to government to ensure that the agenda is not derailed, adding that students were part of the main group that would benefit when these programmes and policies are eventually realized. According to the Minister, “We will continue to count on your support because at the end of the day, what the President is doing is building a foundation for a better tomorrow and those that will benefit in this greater tomorrow are basically yourselves and your membership. “Building a foundation is the most difficult of any construction work you are doing because you will spend time and resources and at the end of the day, you don’t see much, especially if it is a massive building and by all standards, Nigeria is a massive country in terms of size and population. That’s why it takes a lot of time for people to see the foundation to come out. But now the foundation is coming out and people have started to see. “So, we need the primary support of all of you who are the primary stakeholders so that we can build something that as time goes by, all of us will be proud to be associated with,” Bello said. 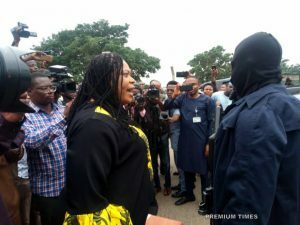 The Minister, who is billed to address the students during their forthcoming rally expressed his admiration and respect for student union leaders, noting that they personify the passion and support of the Nigerian student. He praised their ability to combine unionism with rigorous academic activities. Earlier in his remarks, the Chairman of the Association, Comrade Mojeed Kola Omolaja (M.K.O), commended the FCT Minister for the giant strides recorded in the FCT education sector, especially the infrastructural achievements at the Federal University of Science and Technology, Abaji. Comrade Omolaja, who announced that members of the association would be embarking on a 5-day rally in the FCT, pledged their willingness to collaborate with the FCT Administration in order to promote the interest and welfare of students. He however appealed to the Minister to intensify efforts at beefing up security in the campuses and consider the possibility of empowering a students’-based security outfit to checkmate crime and criminality around the campuses. Highlight of the meeting was the conferment of the award of ‘Grand Patron of Nigerian Students in the FCT’ on the FCT Minister by the association, in recognition of the positive roles the Minister has played in transforming the education sector in the Territory. The NANS Chairman explained that the award was a collective gesture by all the students’ union presidents of the campuses in the FCT, including the University of Abuja, School of Nursing, and the College of Education.